Note: You will need the Tomato & Garlic Sauce recipe for this dish. 2. Prepare all of the ingredients based on the instructions in the ingredients list. 1. Warm the olive oil in a frying pan. 2. Gently sauté the onion and garlic for 2–3 minutes in the olive oil. 3. Add the seasonal leafy greens (e.g. silverbeet) to the pan and stir to coat in oil. Sauté for another 3 minutes. 5. Drain off any excess liquid created during the cooking process. 6. Mix the ricotta, eggs, grated nutmeg, parmesan, lemon zest, herbs, salt and pepper in the large mixing bowl. 7. Add the greens, mix well, taste and season if necessary. 8. Store in the fridge until needed. 1. Peel the zucchini lengthways using the wide peeler to create wide strips. 1. 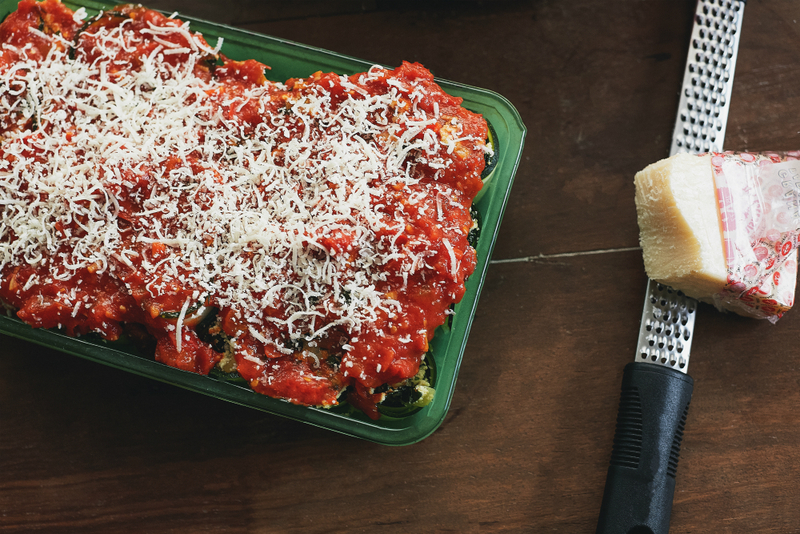 Spread half the quantity of the Tomato & Garlic Sauce onto the base of the large, shallow baking dish. 2. Place a zucchini ribbon on the bench and spoon 1 tbsp of the ricotta mixture onto the narrowest end. 3. Roll up to form a ‘cannelloni’, and place into the prepared baking dish with one open end facing up. 4. Repeat with the remaining zucchini ribbons and ricotta mixture. 5. Pour the rest of the tomato sauce over the cannelloni and top with the remaining parmesan. 6. Bake in the oven for 20 minutes, or until the top is golden brown and the zucchini is soft when tested with a fork.